Driving through Topanga Canyon to get to the beach is one of my favorite summer outings. 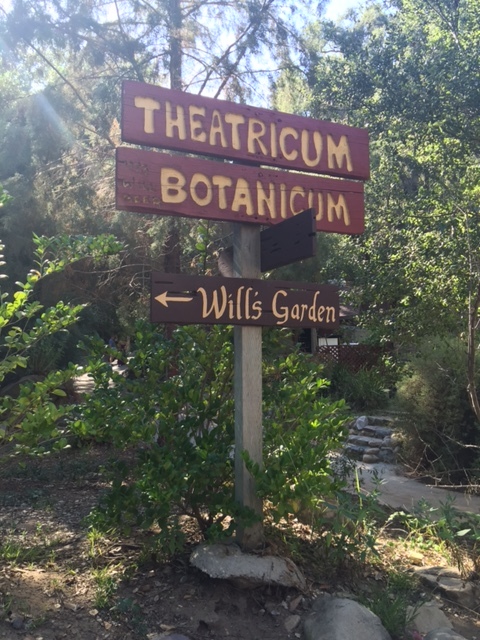 I always notice cars parked along the side of the road next to the Will Geer’s Theatricum Botanicum. Last weekend, I stopped to see the lively production of “As You Like It.” As we sat outside among ancient oak trees, we watched Shakespeare’s words come to life. Don’t like or understand Shakespeare? This production will favorably change your mind. The cast not only recite his poetry with great vocal intonation and facial expressions, but their physical movements enhance each word spoken. Director Ellen Geer set this production in a post-Civil War America. It’s about banished lovers meeting in the forest, some disguised, who befriend a lovable cult of musical oddballs. Many of the talented cast members play musical instruments throughout the show with harmonicas, guitars, drums, horns and an accordion that enrich one’s senses. The star of the show is Willow Geer as Rosalind. She was born to be onstage as she displays talent and poise beyond her years. She and California surfer-looking Colin Simon, who plays Orlando exquisitely, display engaging chemistry when onstage together. Without each other, they still shine, especially when Geer’s character has to disguise herself into a young man and fend off the love of the silly Phebe, played by the pretty Christine Breihan. Rosalind’s cousin Celia, played by Elizabeth Tobias, is an adorable and lovable supporting character Rosalind’s best friend. Other scene stealers were Crystal Clark as Audrey and Gerald C. Rivers as Touchstone, the Fool traipsing onto the stage with his heightened humor. In the end, I rooted for their union. Ellen Geer has been exposed to theater and Shakespeare her entire life. Being the talented daughter of the legendary stage and television actor Will Geer a.k.a. Grandpa Walton in the 1970s classic television show – The Walton’s. She is now the artistic director of the theater that her father established in the 1950s. You will find Geer and her family acting, teaching, producing and directing most of the shows. Geer’s scenes flow seamlessly as the actors use the wooden stage and natural canyon. Actors hide behind majestic oak trees waiting for their cue, or stroll down a dirt path covered with leaves, as if they have been on a long journey to join the others on stage. It’s true outdoor theater at its finest. I kept thinking live deer would curiously walk down the hill to check out the show. Are you a Walton’s Fan? 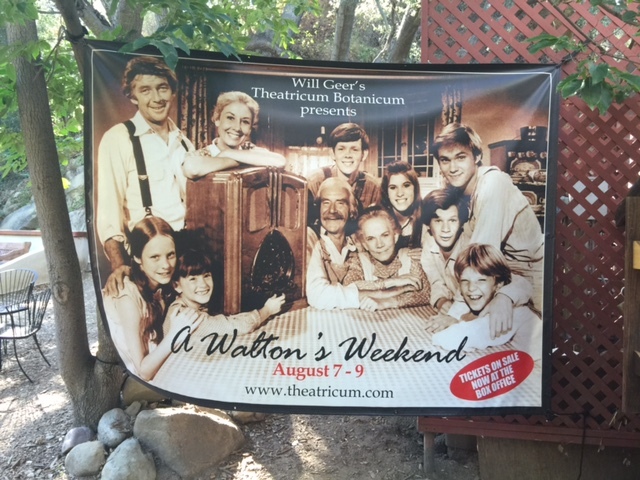 The Theaticum Botanicum is hosting a Walton’s Weekend for the public to enjoy with some of the cast members. Come meet Olivia, Elizabeth, Jim Bob, Erin, Mary Ellen and Ben Walton in person. Enjoy a Walton themed dinner and film on Friday, August 7 at 6 p.m. at the Mountain Mermaid in Topanga. On Sunday, August 9 and 9 a.m. join others on a bus tour to the Walton’s set at the Warner Brothers Ranch in Burbank with refreshments and episodes of the family television show play during the ride. 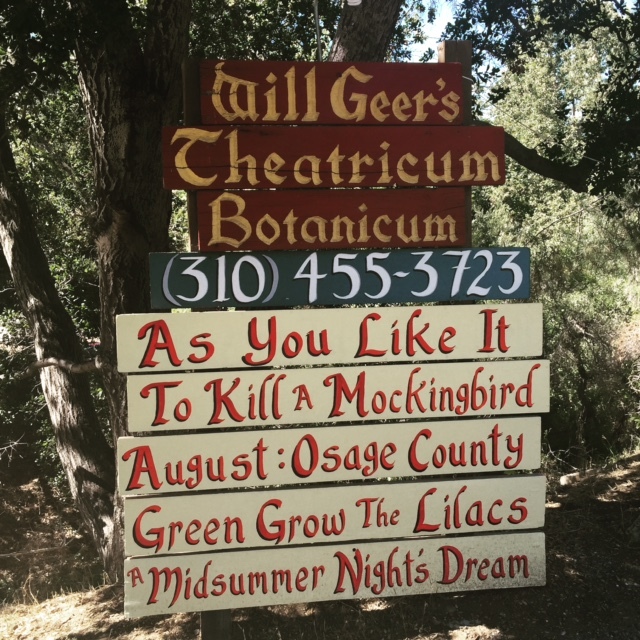 All proceeds from this fun weekend will benefit the Will Geer’s Theatricum Botanicum to provide theater and art education to the community of Los Angeles and beyond. To get a schedule of the shows, go to http://www.theatricum.com. 1419 N Topanga Canyon Blvd. Topanga (310)455-2322.